i want Sue's cakes in here. 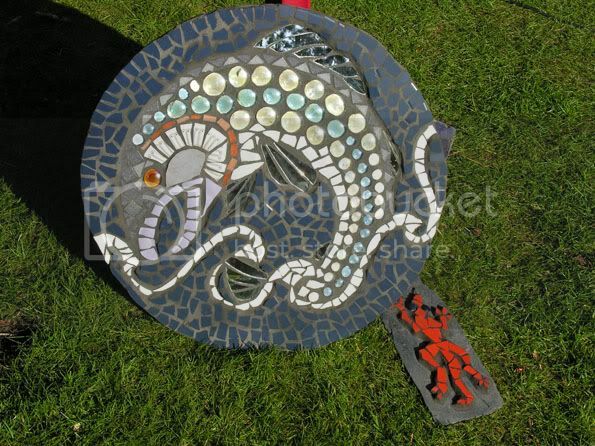 and Mad's wonderful Magic Salmon mosaic. and everything else that fits. The fins are mirror, the rest is glass beads, bits of plates, and tiles. It still needs the wooden backing varnished, to keep out the wet. It IS round- the angled bit on the right is something else lurking behind it. WOW! that is SO cool! absolutely mindbogglingly amazing. so did you draw out the pattern and then fill in the bits? your fingers must have been MANGLED. totally beautiful. p.s. never thought i'd say it, but am loving the ickle gecko. my ex is looking at it with rapt wonder and asks if he can show it as an inspiration to a friend who wants to do mosaic. now THAT is a work of art Totally grand! I love it! Mad - there is no doubt that salmon is fantastic! I love it! Definitely droolsome, Sue! More! More! Mackie - please tell ex he's free to show fish to whoever! Jana - fingers mostly survived - I sketched the pattern on the wooden base, then it's like free-form jigsawing - use tile or glass cutters to make the shapes how you want them, (or say to hell with it and use the shape they insist in being! recalcitrant little b*ggers!) stuck down with tile adhesive or PVA glue, then grouted. I only managed to spike myself on one piece of mirror, and that was when I was grouting - whew! Only thing now is - it's addictive. I want to do more, and I have no space to do so. Waah! was wondering about that - whether the shapes decided the design or you. i love that little gecko. the fins of the salmon are really beautiful. i imagine they look absolutely gorgeous when they catch the light. Mad - space for the making or the displaying? Really hope you get to do more - would love to see a dragon!!! Both sorts of spaces! The fish is heading for my Mum's - rather than a table (the surface is at 2 levels and would be risky for wine glasses!) he'll probably go on an outside wall. I'd love to do a dragon....and Celtic stuff... and more fish...(there was a pic of a gorgeous octopus!)... mermaid.....spider.... sigh. Ooooh! Can you imagine a walled garden (like mine!) with mosaics all over the walls? It would be fantastic!